Sometimes it's good to be reminded of just how far technology has come in our lifetimes. 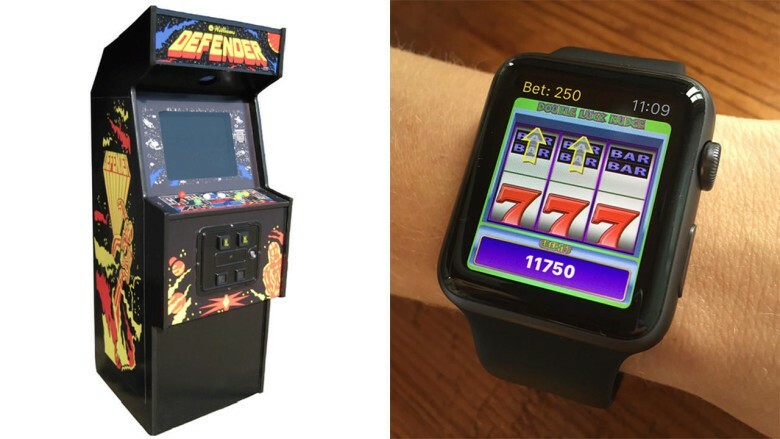 You can now play the slots from your Apple Watch, thanks to a recent new game entitled Double Luck Nudge, created by bona fide video game legend Larry DeMar. DeMar was most famously responsible for co-creating the hit 1981 arcade coin-op Defender — a.k.a. the arcade machine on which the original Mac team racked up thousands of hours playing while putting together the original Macintosh. Interestingly, DeMar says that he can see gambling on the Apple Watch becoming a big deal, if more states legalize online gambling that is. Right now, the $2.99 app simply lets users play for credits. My real purpose for including this app story here, however, is because of the cool link with the original Macintosh. Defender helped inspire the creators of the original Mac, and now the Apple Watch is being used by Defender‘s creator to usher in a new platform for gaming. How’s that for a full circle? You can read original Mac software engineer Andy Hertzfeld’s thoughts on Defender here, and download Double Luck Nudge on the App Store here.